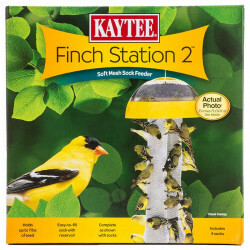 Want an easy, inexpensive way to bring beautiful groups of finch birds to your house? Pet Mountain has you covered with these finch and thistle feeders. Whether you need a feeding station or a finch feeding sock refill, Pet Mountain's discounted prices can save you up to 70% off on all finch and thistle feeding accessories. Our finch and thistle feeders are provided by two of the biggest brands in the wild bird feeding industry -- Perky Pet and Kaytee. These companies have devised the best ways to attract finches with their high-quality finch feeding stations. 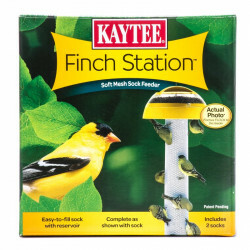 Kaytee's Finch Station 2 Sock Feeder makes attracting flocks of finches a cinch. The feeder's unique squiggle sock holds 2.75 quarts of seed to make for less refilling. Uninterrupted feedings thanks to the unique gravity feed system enocurages the finch to stay longer and feed. 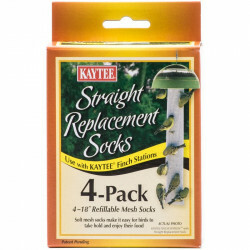 Stock up with the incredibly long-lasting Finch Station Squiggle Replacement Socks. 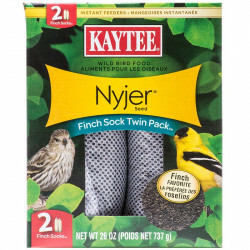 These refillable mesh socks make it easy for birds to grasp on and feed, and the simple station design makes replacing old thistle socks a breeze. If you're looking for something more simple, Perky Pet's Thistle Sack Finch Feeder is just what you need. 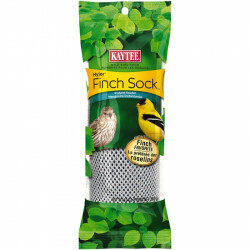 This decorative finch feeder sack is easy for finches to cling to, holds 3 lbs. of thistle seed, and is easy to hang. Perky Pet's Upside Down Thistle Feeder features a yellow dome water seal that makes the feeder weather resistant. This thistle feeder for finches holds 2 lbs. of seed. 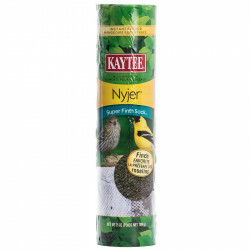 Kaytee's Finch Tube Feeders offer a different take on your standard finch feeder. This feeder's coiled perch design offers staggered feeding for finches that helps them from bunching up over one another. If you've been attracting a lot of finches, this hanging finch feeder is a great option. Finch and thistle feeders from Pet Mountain are an easy way to experience one of the most beautiful wild birds out there. You'll find all the accessories, sock refills, and finch feeder stations right here at Pet Mountain, your online provider for all your wild bird products and supplies.